Glucose transporter type 4, also known as GLUT4, is a protein encoded, in humans, by the GLUT4 gene. GLUT4 is the insulin-regulated glucose transporter found primarily in adipose tissues and striated muscle (skeletal and cardiac). The first evidence for this distinct glucose transport protein was provided by David James in 1988. The gene that encodes GLUT4 was cloned and mapped in 1989. Recent reports demonstrated the presence of GLUT4 gene in central nervous system such as the hippocampus. Moreover, impairment in insulin-stimulated trafficking of GLUT4 in the hippocampus result in decreased metabolic activities and plasticity of hippocampal neurons, which leads to depressive like behaviour and cognitive dysfunction. Under conditions of low insulin, most GLUT4 is sequestered in intracellular vesicles in muscle and fat cells. Insulin induces a rapid increase in the uptake of glucose by inducing the translocation of GLUT4 from these vesicles to the plasma membrane. As the vesicles fuse with the plasma membrane, GLUT4 transporters are inserted and become available for transporting glucose, and glucose absorption increases. Insulin’s actions are effectively abolished in the genetically engineered muscle insulin receptor knock‐out (MIRKO) mouse because they have a complete lack of the insulin‐sensitive glucose transport protein, GLUT4, in muscle, so insulin has no effect on glucose uptake. Fascinatingly, this is of little or no consequence to the animal that does not have fasting hyperglycaemia or diabetes. 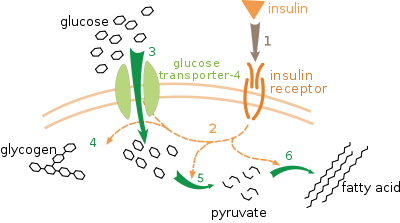 The insulin signal transduction pathway begins when insulin binds to the insulin receptor proteins. Once the transduction pathway is completed, the GLUT-4 storage vesicles becomes one with the cellular membrane. As a result the GLUT-4 protein channels become embedded into the membrane, allowing allowing glucose to be transported into the cell. Insulin binds to the insulin receptor in its dimeric form and activates the receptor's tyrosine-kinase domain. The receptor then phosphorylates and subsequently recruits Insulin Receptor Substrate or IRS-1, which in turn binds the enzyme PI-3 kinase through the binding of the enzyme's SH2 domain to the pTyr of IRS. PI-3 kinase converts the membrane lipid PIP2 to PIP3. PIP3 is specifically recognized by the PH domains of PKB (protein kinase B) or AKT, and also for PDK1 which, being localized together with PKB, can phosphorylate and activate PKB. Once phosphorylated, PKB is in its active form and phosphorylates TBC1D4, which inhibits the GAP domain or the GTPase-activating domain associated with TBC1D4, allowing for Rab protein to change from its GDP to GTP bound state. Inhibition of the GTPase-activating domain leaves proteins next in the cascade in their active form and stimulates GLUT4 to be expressed on the plasma membrane. RAC1 is a GTPase which is also activated by insulin. Rac1 stimulates reorganization of the cortical Actin cytoskeleton  which allows for the GLUT4 vesicles to be inserted into the plasma membrane. RAC1 Knockout mouse have reduced glucose uptake in muscle. Muscle contraction stimulates muscle cells to translocate GLUT4 receptors to their surfaces. This is especially true in cardiac muscle, where continuous contraction can be relied upon; but is observed to a lesser extent in skeletal muscle. In skeletal muscle, muscle contraction increase GLUT4 translocation several fold  and this is likely regulated by RAC1  and AMP-activated protein kinase. Muscle stretching also stimulate GLUT4 translocation and glucose uptake in rodent muscle via RAC1. GLUT4 has been shown to interact with death-associated protein 6. ↑ James DE, Brown R, Navarro J, Pilch PF (May 1988). "Insulin-regulatable tissues express a unique insulin-sensitive glucose transport protein". Nature. 333 (6169): 183–5. doi:10.1038/333183a0. PMID 3285221. ↑ James DE, Strube M, Mueckler M (Mar 1989). "Molecular cloning and characterization of an insulin-regulatable glucose transporter". Nature. 338 (6210): 83–7. doi:10.1038/338083a0. PMID 2645527. ↑ Birnbaum MJ (Apr 1989). "Identification of a novel gene encoding an insulin-responsive glucose transporter protein". Cell. 57 (2): 305–15. doi:10.1016/0092-8674(89)90968-9. PMID 2649253. ↑ Bell GI, Murray JC, Nakamura Y, Kayano T, Eddy RL, Fan YS, Byers MG, Shows TB (Aug 1989). "Polymorphic human insulin-responsive glucose-transporter gene on chromosome 17p13". Diabetes. 38 (8): 1072–5. doi:10.2337/diabetes.38.8.1072. PMID 2568955. ↑ Patel SS, Udayabanu M (Mar 2014). "Urtica dioica extract attenuates depressive like behavior and associative memory dysfunction in dexamethasone induced diabetic mice". Metabolic Brain Disease. 29 (1): 121–30. doi:10.1007/s11011-014-9480-0. PMID 24435938. ↑ Piroli GG, Grillo CA, Reznikov LR, Adams S, McEwen BS, Charron MJ, Reagan LP (2007). "Corticosterone impairs insulin-stimulated translocation of GLUT4 in the rat hippocampus". Neuroendocrinology. 85 (2): 71–80. doi:10.1159/000101694. PMID 17426391. ↑ Huang CC, Lee CC, Hsu KS (2010). "The role of insulin receptor signaling in synaptic plasticity and cognitive function". Chang Gung Medical Journal. 33 (2): 115–25. PMID 20438663. ↑ Cushman SW, Wardzala LJ (May 1980). "Potential mechanism of insulin action on glucose transport in the isolated rat adipose cell. Apparent translocation of intracellular transport systems to the plasma membrane" (PDF). The Journal of Biological Chemistry. 255 (10): 4758–62. PMID 6989818. ↑ Sonksen P, Sonksen J (Jul 2000). "Insulin: understanding its action in health and disease". British Journal of Anaesthesia. 85 (1): 69–79. doi:10.1093/bja/85.1.69. PMID 10927996. ↑ JeBailey L, Wanono O, Niu W, Roessler J, Rudich A, Klip A (Feb 2007). "Ceramide- and oxidant-induced insulin resistance involve loss of insulin-dependent Rac-activation and actin remodeling in muscle cells". Diabetes. 56 (2): 394–403. doi:10.2337/db06-0823. PMID 17259384. ↑ Sylow L, Kleinert M, Pehmøller C, Prats C, Chiu TT, Klip A, Richter EA, Jensen TE (Feb 2014). "Akt and Rac1 signaling are jointly required for insulin-stimulated glucose uptake in skeletal muscle and downregulated in insulin resistance". Cellular Signalling. 26 (2): 323–31. doi:10.1016/j.cellsig.2013.11.007. PMID 24216610. 1 2 Sylow L, Jensen TE, Kleinert M, Højlund K, Kiens B, Wojtaszewski J, Prats C, Schjerling P, Richter EA (Jun 2013). "Rac1 signaling is required for insulin-stimulated glucose uptake and is dysregulated in insulin-resistant murine and human skeletal muscle". Diabetes. 62 (6): 1865–75. doi:10.2337/db12-1148. PMC 3661612 . PMID 23423567. ↑ Watson RT, Kanzaki M, Pessin JE (Apr 2004). "Regulated membrane trafficking of the insulin-responsive glucose transporter 4 in adipocytes". Endocrine Reviews. 25 (2): 177–204. doi:10.1210/er.2003-0011. PMID 15082519. ↑ Stenbit AE, Tsao TS, Li J, Burcelin R, Geenen DL, Factor SM, Houseknecht K, Katz EB, Charron MJ (Oct 1997). "GLUT4 heterozygous knockout mice develop muscle insulin resistance and diabetes". Nature Medicine. 3 (10): 1096–101. doi:10.1038/nm1097-1096. PMID 9334720. ↑ Lund S, Holman GD, Schmitz O, Pedersen O (Jun 1995). "Contraction stimulates translocation of glucose transporter GLUT4 in skeletal muscle through a mechanism distinct from that of insulin". Proceedings of the National Academy of Sciences of the United States of America. 92 (13): 5817–21. doi:10.1073/pnas.92.13.5817. PMC 41592 . PMID 7597034. ↑ Jensen TE, Sylow L, Rose AJ, Madsen AB, Angin Y, Maarbjerg SJ, Richter EA (Oct 2014). "Contraction-stimulated glucose transport in muscle is controlled by AMPK and mechanical stress but not sarcoplasmatic reticulum Ca(2+) release". Molecular Metabolism. 3 (7): 742–53. doi:10.1016/j.molmet.2014.07.005. PMC 4209358 . PMID 25353002. ↑ Sylow L, Møller LL, Kleinert M, Richter EA, Jensen TE (Dec 2014). "Rac1--a novel regulator of contraction-stimulated glucose uptake in skeletal muscle". Experimental Physiology. 99 (12): 1574–80. doi:10.1113/expphysiol.2014.079194. PMID 25239922. ↑ Sylow L, Jensen TE, Kleinert M, Mouatt JR, Maarbjerg SJ, Jeppesen J, Prats C, Chiu TT, Boguslavsky S, Klip A, Schjerling P, Richter EA (Apr 2013). "Rac1 is a novel regulator of contraction-stimulated glucose uptake in skeletal muscle". Diabetes. 62 (4): 1139–51. doi:10.2337/db12-0491. PMC 3609592 . PMID 23274900. ↑ Mu J, Brozinick JT, Valladares O, Bucan M, Birnbaum MJ (May 2001). "A role for AMP-activated protein kinase in contraction- and hypoxia-regulated glucose transport in skeletal muscle". Molecular Cell. 7 (5): 1085–94. doi:10.1016/s1097-2765(01)00251-9. PMID 11389854. ↑ Sylow L, Møller LL, Kleinert M, Richter EA, Jensen TE (Feb 2015). "Stretch-stimulated glucose transport in skeletal muscle is regulated by Rac1". The Journal of Physiology. 593 (3): 645–56. doi:10.1113/jphysiol.2014.284281. PMC 4324711 . PMID 25416624. ↑ Lalioti VS, Vergarajauregui S, Pulido D, Sandoval IV (May 2002). "The insulin-sensitive glucose transporter, GLUT4, interacts physically with Daxx. Two proteins with capacity to bind Ubc9 and conjugated to SUMO1". The Journal of Biological Chemistry. 277 (22): 19783–91. doi:10.1074/jbc.M110294200. PMID 11842083. Slot JW, Geuze HJ, Gigengack S, Lienhard GE, James DE (Apr 1991). "Immuno-localization of the insulin regulatable glucose transporter in brown adipose tissue of the rat". The Journal of Cell Biology. 113 (1): 123–35. doi:10.1083/jcb.113.1.123. PMC 2288909 . PMID 2007617. Govers R, Coster AC, James DE (Jul 2004). "Insulin increases cell surface GLUT4 levels by dose dependently discharging GLUT4 into a cell surface recycling pathway". Molecular and Cellular Biology. 24 (14): 6456–66. doi:10.1128/MCB.24.14.6456-6466.2004. PMC 434240 . PMID 15226445. Ng Y, Ramm G, Lopez JA, James DE (Apr 2008). "Rapid activation of Akt2 is sufficient to stimulate GLUT4 translocation in 3T3-L1 adipocytes". Cell Metabolism. 7 (4): 348–56. doi:10.1016/j.cmet.2008.02.008. PMID 18396141. Foster LJ, Klip A (Oct 2000). "Mechanism and regulation of GLUT-4 vesicle fusion in muscle and fat cells". American Journal of Physiology. Cell Physiology. 279 (4): C877–90. PMID 11003568. Bryant NJ, Govers R, James DE (Apr 2002). "Regulated transport of the glucose transporter GLUT4". Nature Reviews. Molecular Cell Biology. 3 (4): 267–77. doi:10.1038/nrm782. PMID 11994746. Baumann MU, Deborde S, Illsley NP (Oct 2002). "Placental glucose transfer and fetal growth". Endocrine. 19 (1): 13–22. 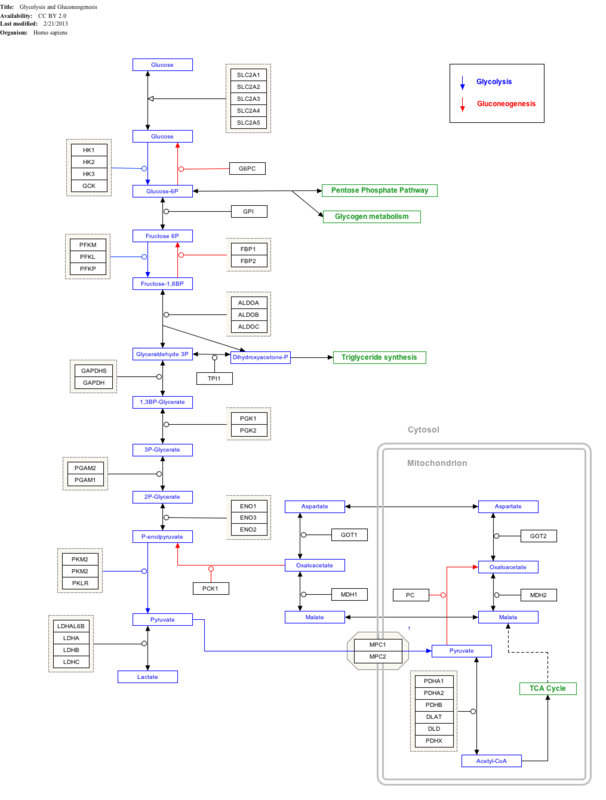 doi:10.1385/ENDO:19:1:13. PMID 12583599. Olson AL, Knight JB (May 2003). "Regulation of GLUT4 expression in vivo and in vitro". Frontiers in Bioscience. 8 (1-3): s401–9. doi:10.2741/1072. PMID 12700047. McCarthy AM, Elmendorf JS (Mar 2007). "GLUT4's itinerary in health & disease". The Indian Journal of Medical Research. 125 (3): 373–88. PMID 17496362. Buse JB, Yasuda K, Lay TP, Seo TS, Olson AL, Pessin JE, Karam JH, Seino S, Bell GI (Nov 1992). "Human GLUT4/muscle-fat glucose-transporter gene. Characterization and genetic variation". Diabetes. 41 (11): 1436–45. doi:10.2337/diabetes.41.11.1436. PMID 1397719. O'Rahilly S, Krook A, Morgan R, Rees A, Flier JS, Moller DE (May 1992). "Insulin receptor and insulin-responsive glucose transporter (GLUT 4) mutations and polymorphisms in a Welsh type 2 (non-insulin-dependent) diabetic population". Diabetologia. 35 (5): 486–9. doi:10.1007/BF02342449. PMID 1521731. Liu ML, Olson AL, Moye-Rowley WS, Buse JB, Bell GI, Pessin JE (Jun 1992). "Expression and regulation of the human GLUT4/muscle-fat facilitative glucose transporter gene in transgenic mice". The Journal of Biological Chemistry. 267 (17): 11673–6. PMID 1601840. Choi WH, O'Rahilly S, Buse JB, Rees A, Morgan R, Flier JS, Moller DE (Dec 1991). "Molecular scanning of insulin-responsive glucose transporter (GLUT4) gene in NIDDM subjects". Diabetes. 40 (12): 1712–8. doi:10.2337/diabetes.40.12.1712. PMID 1756912. Kusari J, Verma US, Buse JB, Henry RR, Olefsky JM (Oct 1991). "Analysis of the gene sequences of the insulin receptor and the insulin-sensitive glucose transporter (GLUT-4) in patients with common-type non-insulin-dependent diabetes mellitus". The Journal of Clinical Investigation. 88 (4): 1323–30. doi:10.1172/JCI115437. PMC 295602 . PMID 1918382. Fukumoto H, Kayano T, Buse JB, Edwards Y, Pilch PF, Bell GI, Seino S (May 1989). "Cloning and characterization of the major insulin-responsive glucose transporter expressed in human skeletal muscle and other insulin-responsive tissues". The Journal of Biological Chemistry. 264 (14): 7776–9. PMID 2656669. Chiaramonte R, Martini R, Taramelli R, Comi P (Aug 1993). "Identification of the 5' end of the gene encoding a human insulin-responsive glucose transporter". Gene. 130 (2): 307–8. doi:10.1016/0378-1119(93)90438-9. PMID 7916714. Verhey KJ, Birnbaum MJ (Jan 1994). "A Leu-Leu sequence is essential for COOH-terminal targeting signal of GLUT4 glucose transporter in fibroblasts". The Journal of Biological Chemistry. 269 (4): 2353–6. PMID 8300557. Lee W, Samuel J, Zhang W, Rampal AL, Lachaal M, Jung CY (Nov 1997). "A myosin-derived peptide C109 binds to GLUT4-vesicles and inhibits the insulin-induced glucose transport stimulation and GLUT4 recruitment in rat adipocytes". Biochemical and Biophysical Research Communications. 240 (2): 409–14. doi:10.1006/bbrc.1997.7671. PMID 9388492. Shi Y, Samuel SJ, Lee W, Yu C, Zhang W, Lachaal M, Jung CY (Mar 1999). "Cloning of an L-3-hydroxyacyl-CoA dehydrogenase that interacts with the GLUT4 C-terminus". Archives of Biochemistry and Biophysics. 363 (2): 323–32. doi:10.1006/abbi.1998.1088. PMID 10068455. Abel ED, Kaulbach HC, Tian R, Hopkins JC, Duffy J, Doetschman T, Minnemann T, Boers ME, Hadro E, Oberste-Berghaus C, Quist W, Lowell BB, Ingwall JS, Kahn BB (Dec 1999). "Cardiac hypertrophy with preserved contractile function after selective deletion of GLUT4 from the heart". The Journal of Clinical Investigation. 104 (12): 1703–14. doi:10.1172/JCI7605. PMC 409881 . PMID 10606624. Abel ED, Peroni O, Kim JK, Kim YB, Boss O, Hadro E, Minnemann T, Shulman GI, Kahn BB (Feb 2001). "Adipose-selective targeting of the GLUT4 gene impairs insulin action in muscle and liver". Nature. 409 (6821): 729–33. doi:10.1038/35055575. PMID 11217863.